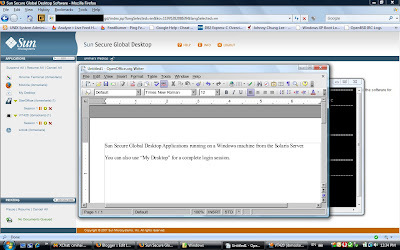 Sun Secure Global Desktop (aka Tarantella) provides secure access (SSL - HTTPS) to centralized UNIX, Windows, Mainframe and Midrange applications from a wide range of popular client devices, including Microsoft Windows PCs, Solaris OS Workstations, thin clients and mobile devices. 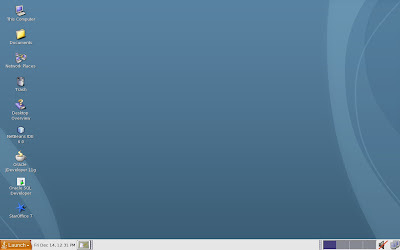 Tarantella is a competitor to Terminal Services from Microsoft and Citrix software, but it's much more interesting (It's got Windows and Citrix connectors, Thin Client stuff, etc). It's basically like GNU Screen (you can resume sessions and easily migrate between machines), but for X and via your web browser :-). The fun part is, with Solaris 10 you can simply install Tarantella in a Zone (Solaris Container). The user names must be "ttaserv" and "ttasys". Both must have their primary group set to "ttaserv". You can use any UIDs and GID you want. The ttaserv/ttasys users must have a valid shell, for example /bin/sh. We recommend that you lock the ttaserv/ttasys user accounts (passwd -l). The users must have a valid home directory too, so if you're using /export/home (/home is the home of the automounter) make sure you do it right. # su ttaserv -c "/usr/bin/id -a"
# su ttasys -c "/usr/bin/id -a"
The security start requires a valid security license and a SSL certificate (you can create a self signed certificate using OpenSSL then import with SSGD). Once SSGD is installed and started, just navigate any Java enabled browser to http://yoursite.yourdomain:selectedport and you're good to go :-). Use "Administrator" and the root password to login. (Use regular system accounts for non-administrative purposes. Oh, and secure SSGD by using Zones).